This document provides details of the proposed logical framework for influenza infection, including several modules for public health interventions and their effects in prevention and control of illness. These interventions include vaccination, use of antiviral drugs, and hospitalization. The aim of this logical framework is to enhance the utility and uptake of modelling for public health responses by building a conceptual framework for common assumptions, plausible interventions, disease outcomes, and the impact of control measures at various stages of infection. For this framework, we will use terms reviewed in a companion document, “Review of Terms Used in Modelling Influenza Infection,” to provide a pathway towards addressing the conceptual gaps and inconsistencies that were found in published studies, particularly in modelling literature. Mathematical, statistical, and computational modelling has become an important tool for addressing complex public health questions and informing policy decision-making. While the integration of modelling into the public health context has already taken place, there remain inconsistencies in the terminology, assumptions, and approaches used to tackle health and policy questions. In particular, modelling frameworks that have been used for influenza have had discrepancies in their structure, relevant parameters, and terms referring to clinical status (e.g., susceptibility, infectivity, and different stages of infection). In order to improve consistency and comparability, we propose a relatively simple logical framework that pertains to the natural history of influenza infection with the inclusion of prevention and control measures. This document provides details of the proposed logical framework for influenza infection, including several modules for public health interventions and their effects in prevention and control of illness. These interventions include vaccination, use of anti-viral drugs, and hospitalization. The aim of this logical framework is to enhance the utility and uptake of modelling for public health responses by building a conceptual framework for common assumptions, plausible interventions, disease outcomes, and the impact of control measures at various stages of infection. For this framework, we will use terms reviewed in a companion document, Review of Terms Used in Modelling Influenza Infection, to provide a pathway towards addressing the conceptual gaps and inconsistencies that were found in published studies, particularly in modelling literature. Infection: refers to a stage of illness during which the infected individual may transmit the pathogen to close contacts, and may show clinical symptoms of the disease. Asymptomatic infection: refers to a stage of infection during which the infected individual can transmit the pathogen without manifesting any clinical symptoms. Pre-symptomatic infection: refers to a stage of infection during which the infected individual can transmit the pathogen before developing clinical symptoms. Symptomatic infection: refers to a stage of infection during which the infected individual can transmit the pathogen and show clinical symptoms. These symptoms may include: fever (or feeling feverish/chills), cough, sore throat, runny or stuffy nose, muscle or body aches, headaches, fatigue (tiredness), and vomiting and diarrhea (more common in children than adults). Severe illness: refers to a state of symptomatic illness with one or more severe symptoms, which may require hospitalized care. Mild illness: refers to a state of symptomatic illness with one or more mild symptoms that do not require hospitalized care, but which may become severe and require inpatient care. Intervention: refers to external measures that are provided to prevent infection or mitigate illness. Prevention: refers to a mechanism to reduce exposure or susceptibility (the probability of contracting infection following exposure). Vaccination: refers to a pharmacological measure to reduce susceptibility. Pre-exposure antiviral prophylaxis: refers to a pharmacological measure to reduce susceptibility. Antiviral treatment: refers to a pharmacological measure that may mitigate the illness, and may alleviate symptoms during infection. It may also reduce the duration of illness or transmission of infection. Hospitalization: refers to additional (supportive) care that may include a physician plan to mitigate severe out- comes and complications of infection. 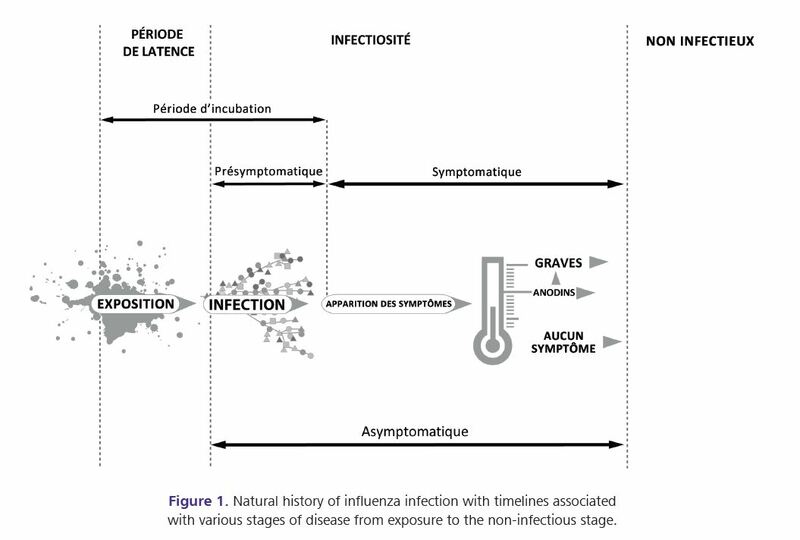 In order to better understand the applicability of intervention measures described above for preven- tion and control of influenza infection, we propose the following diagram (Figure 1) to represent the possible stages of disease following exposure with- out interventions. This diagram combines the natural history of disease with terms associated with changes in epidemiological or clinical status of an individual during the course of infection (for added information on terms not defined within this document, see the companion review of terms). 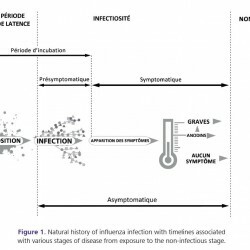 Natural history of influenza infection with timelines associated with various stages of disease from exposure to the non-infectious stage. 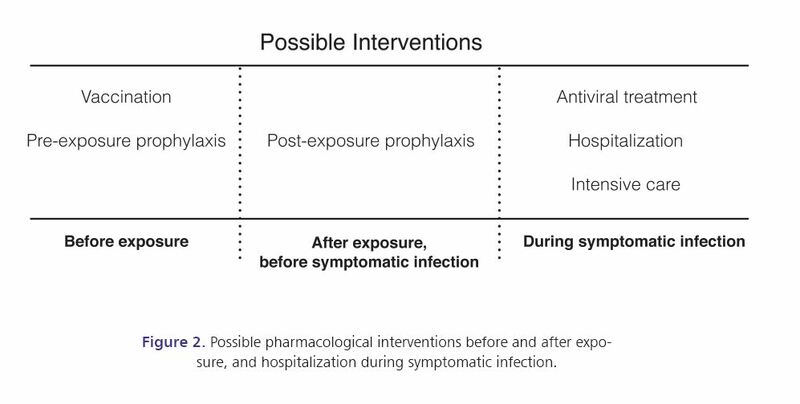 Preventive and therapeutic measures (i.e., vaccination, antiviral drugs, hospitalization and intensive care) can be used at various stages—before and following exposure and/or during illness—as described in the following chart (Figure 2). 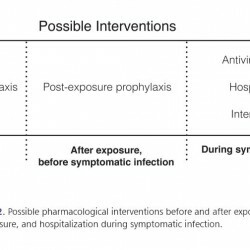 Possible pharmacological interventions before and after exposure, and hospitalization during symptomatic infection. 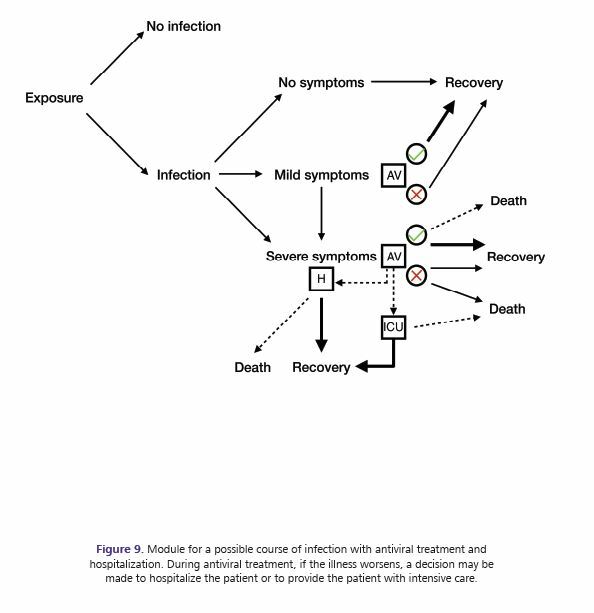 The proposed framework will also consider decision nodes that are associated with various stages of the natural history of infection and interventions. 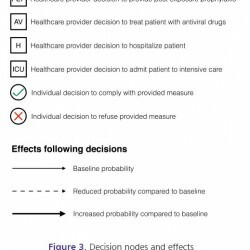 Such decisions are related to the provision of care by a healthcare professional or physician, and individual compliance with the intervention measure (Figure 3). 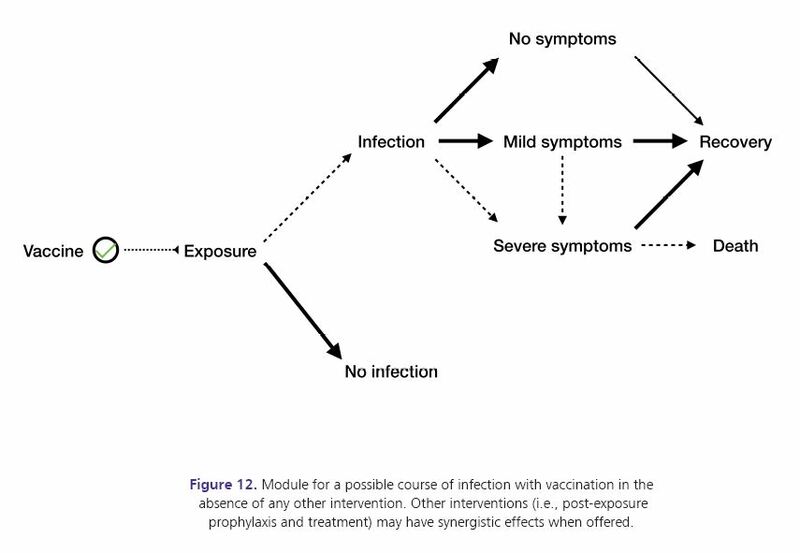 These interventions may have effects in primary prevention (e.g., vaccination, post-exposure prophylaxis); secondary prevention that follows from a screening test applied during the pre- symptomatic stage; and tertiary prevention (e.g., treatment of symptomatic individuals, hospitalization of patients). Each of these interventions could have varying degrees of effect at the individual level, which depend on the immune status of the individuals and other health conditions, as well as the timing of intervention and the level of compliance. 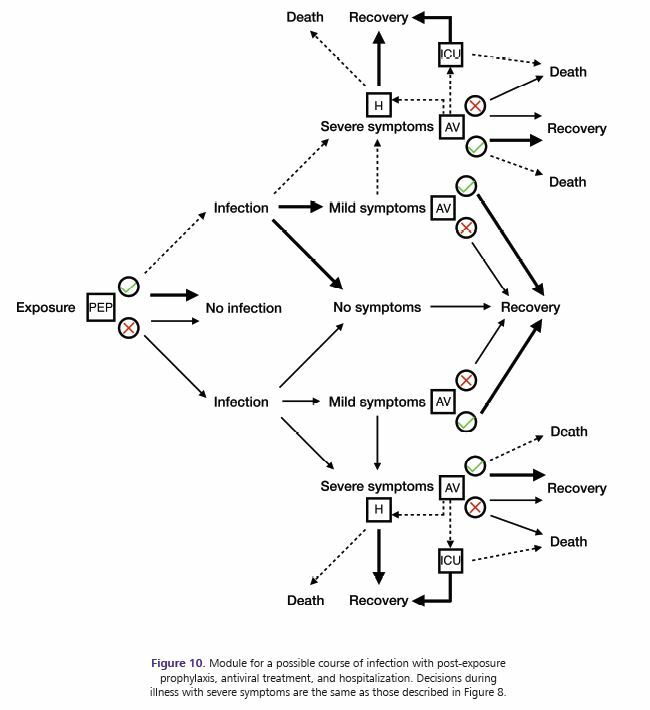 Decision nodes and effects following exposure to infection. This list applies to all modules described below. While primary prevention of infection is certainly a self-protection mechanism, the effects also extend well beyond the individual by reducing the potential for transmission to contacts and minimizing the spread of infection in the population as a whole. 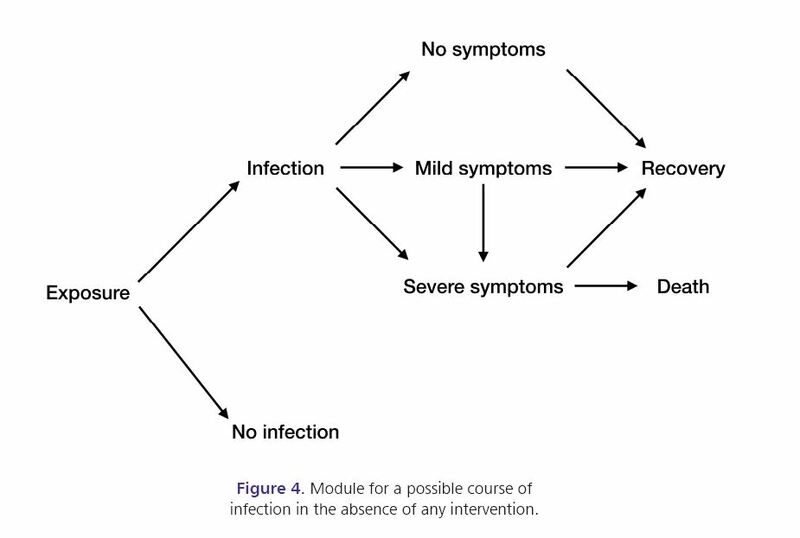 Similarly, secondary and tertiary interventions could reduce potential infectious contacts, and may therefore induce similar effects as primary interventions for other individuals at risk of contracting infection. 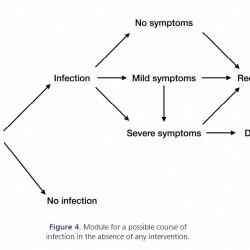 Module for a possible course of infection in the absence of any intervention. 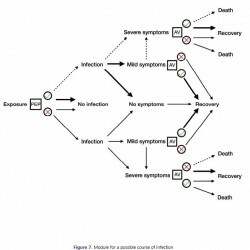 All modules proposed in the logical framework correspond to the possible course of infection and outcomes in a single individual. Reduced or increased probabilities of events (or outcomes) are compared to the baseline probabilities associated with the same individual in the absence of interventions. Due to variability in individuals’ characteristics and health status, these probabilities may differ between individuals, and these variations can be captured in heterogeneous models (e.g., agent-based models) that employ a bottom-up approach to build the in-silico population (i.e., computer representation of a real community) based on the smallest component, which is the individual. 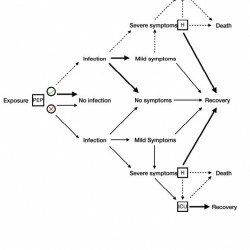 Using such models and their computational capacity, it is possible to systematically test different hypotheses related to attributes of the individuals and to the estimated effectiveness of interventions, and investigate how macro phenomena (e.g., disease spread and evolution) are emerging from micro processes (e.g., the development and control of disease at the individual level) among a heterogeneous set of interacting individuals (referred to as a population). 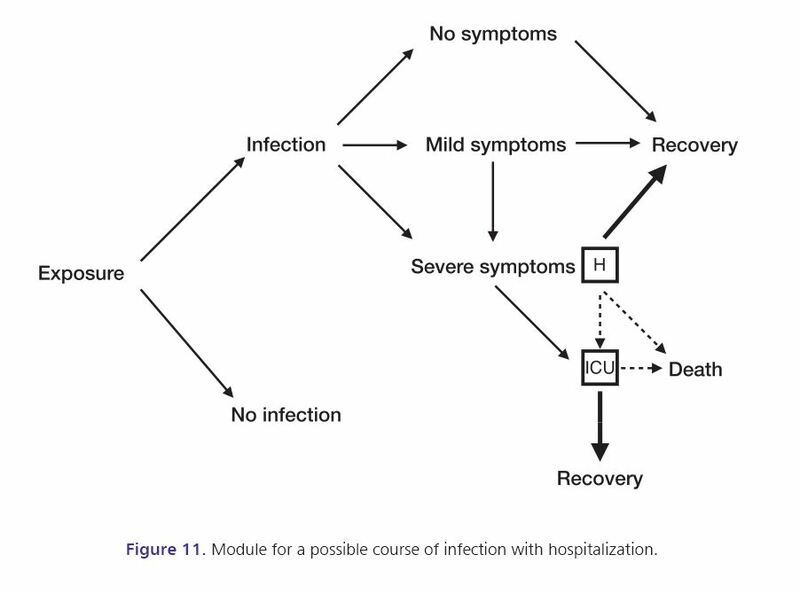 Following exposure, if infection occurs, individuals may not manifest any symptoms during the entire infectious period, and may, therefore, complete the path of infection as asymptomatic carriers until recovery. If symptomatic infection develops, individuals may experience mild or severe symptoms. During illness with mild symptoms, it is possible to develop severe symptoms. 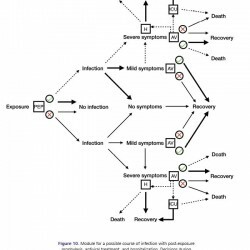 Two possible outcomes of symptomatic infection could be recovery from illness (which may be associated with some lifetime conditions) or death due to complications. This module represents the baseline (i.e., in the absence of any intervention) against which the course of infection in other modules is compared. In this section, modules with control measures following exposure are provided. Post-exposure prophylaxis: This control measure (pending healthcare provider decision) may be offered following exposure (usually to close contacts of identified infectious individuals) in order to prevent infection, or mitigate illness if infection occurs. If the exposed individual does not comply with this measure (i.e., decision to refuse taking post-exposure prophylaxis), the possible course of the disease will remain unchanged from the baseline case (i.e., no intervention). If the individual decides to comply with this measure, the probability of developing infection may be reduced. Furthermore, if infection occurs, the probability of having asymptomatic infection (with no symptoms) or symptomatic infection (with mild symptoms) may be increased, while the probability of developing severe symptomatic infection may be reduced. Antiviral treatment: In addition to postexposure prophylaxis, a symptomatically ill individual (with either mild or severe illness) may seek care and be offered antiviral treatment. Individuals who receive treatment during symptomatic illness and comply with this measure may have a greater probability of recovery, possibly shorter duration of illness, with a lower probability of severe complications leading to death compared to those who do not receive treatment or do not comply with this measure. 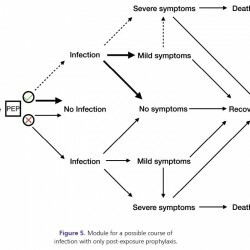 Module for a possible course of infection with only post-exposure prophylaxis. 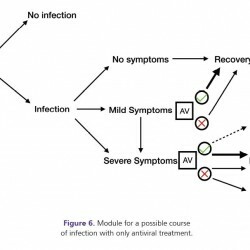 Module for a possible course of infection with only antiviral treatment. Module for a possible course of infection with post-exposure prophylaxis and antiviral treatment. 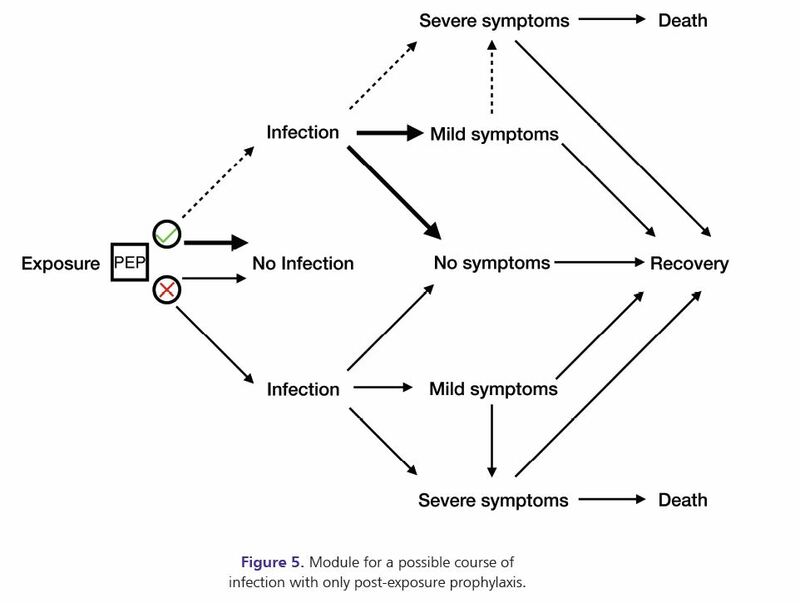 Module for a possible course of infection with post-exposure prophylaxis and hospitalization. During hospital care, if the illness worsens, a decision may be made to provide the patient with intensive care. 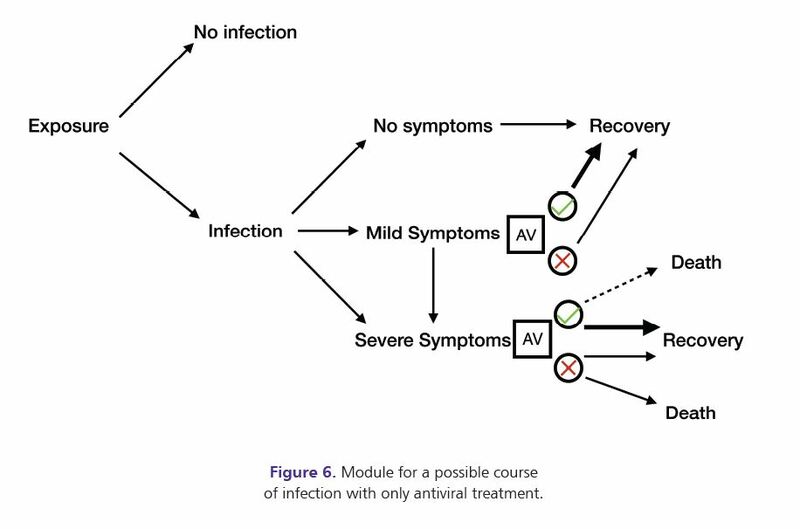 Module for a possible course of infection with antiviral treatment and hospitalization. During antiviral treatment, if the illness worsens, a decision may be made to hospitalize the patient or to provide the patient with intensive care. Module for a possible course of infection with post-exposure prophylaxis, antiviral treatment, and hospitalization. Decisions during illness with severe symptoms are the same as those described in Figure 8. 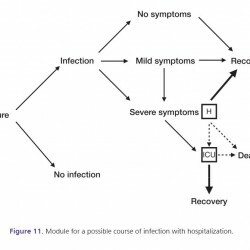 Module for a possible course of infection with hospitalization. Module for a possible course of infection with vaccination in the absence of any other intervention. Other interventions (i.e., post-exposure prophylaxis and treatment) may have synergistic effects when offered. Pre-exposure prophylaxis: This measure is offered to individuals at risk of infection (before exposure) in order to reduce the probability of contracting infection. The effect of this measure in reducing the probability of acquiring infection requires continuous daily antiviral prophylaxis, as it does not induce any long-lasting protective effect. Vaccination: Individuals at risk of infection may receive vaccine. When received sufficiently long before exposure, vaccination may be effective, that is, it can prevent infection in individuals by stimulating an adaptive immune response (i.e., antibody protection). 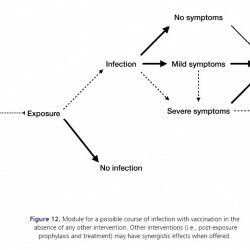 If vaccination is not sufficiently effective in preventing infection, it may reduce the probability that infected individuals develop symptomatic infection (with mild or severe illness) or, for those who develop symptomatic infection, it may reduce the probability of their requiring hospitalization and of developing severe complications leading to death. The effect of this preventive measure functions synergistically with the effect of other control measures (described in modules 5-11). Strategic use of preventive and control measures, which may be subject to the determination of priority groups, timelines for policy implementation, and the population level of interventions. Timely use of intervention measures; for example, early use of antiviral drugs for reducing risk of severe complications and viral shedding; and timely vaccination prior to exposure to reduce the risk of infection. 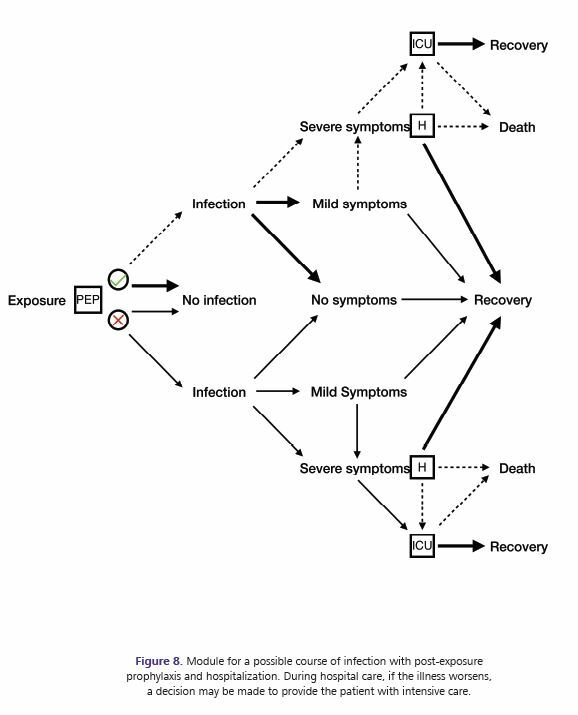 Severity of infection, which is influenced by the pathogenic nature of disease and immune status of the individuals that may be affected by age, co-morbid illness, and several variables related to the social determinants of health (e.g., critical infrastructure such as access to clean water, sanitization, quality living 14 conditions). Furthermore, access to healthcare could influence primary prevention (e.g. immunization) or tertiary prevention (e.g. timely care when illness occurs). These factors can be included in the development of models based on the framework proposed here. Due to heterogeneity and interdependencies in these factors, appropriate models (e.g., agent-based models)2,3 should have the capacity to integrate the variability in parameters and conditions that influence the effectiveness of intervention measures at both the individual and population levels. Modules proposed here do not include nonpharmacological primary preventive interventions (e.g., social distancing measures such as quarantine of individuals suspected to be carriers of disease, isolation of individuals who are infectious, school closure or cancelation of gatherings and social events, and other factors such as nutrition, access to clean water and sanitation, and quality living conditions). The effectiveness of both pharmacological and non-pharmacological interventions is further affected by population demographic and geographic characteristics, and the strength of social ties that are extremely important in determining who acquires infection from whom. 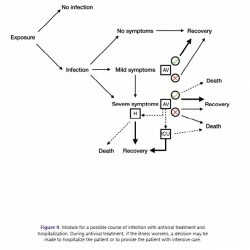 The modules of the logical framework also do not include infection control practices that are generally implemented in specific settings, such as hospitals and other healthcare facilities that provide important resources for disease control, but may also serve as ‘hot spots’ for disease transmission, with subsequent hospital-to-community spread. When considering these modules for hospitalized care, one may consider the implementation of infection control practices and evaluate the effectiveness of such measures. Policy decisions in healthcare and public health depend not only on effectiveness of intervention measures, but also on incremental and absolute cost-effectiveness, and the opportunity costs associated with policy implementation. 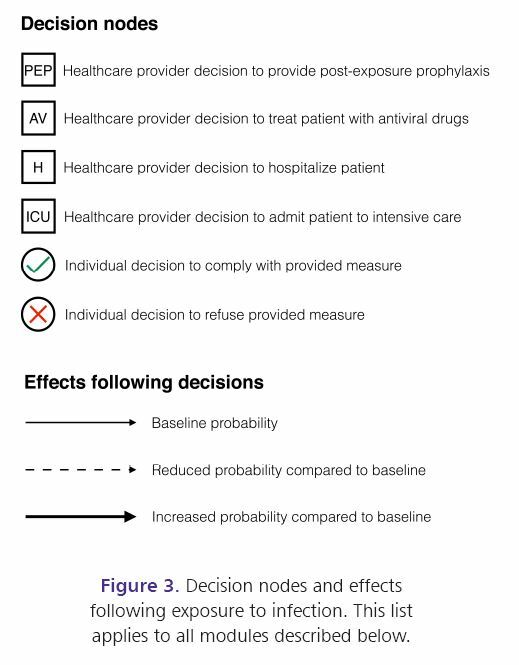 While evaluation of cost-effectiveness can be conducted independently of the logical framework of influenza infection proposed here, any economic evaluation is affected by the type and effectiveness of interventions, timelines for their use, and whether a single or combination of measures are implemented. Clearly, the methodology, assumptions and data sources used for this evaluation could influence the outcomes. For example, both a bottom-up approach (where cost is collected at the patient level) and a top-down approach (where aggregate cost values are used) can be employed to perform cost-effectiveness analysis. While such analysis may require introduction of fixed and variable, direct and indirect cost data associated with strategy implementation, a number of different data sources can be used including: survey data, administrative claims data, prescription data, and outpatient costs. The objectives of the cost-effectiveness analysis are a key factor in determining the methodology and data sources used for evaluation. However, since such analysis focuses on the main direct outcomes of an intervention, secondary or indirect outcomes of the intervention may not be accounted for. For example, an analysis that suggests that a wide-scale use of antiviral drugs may be a cost-effective strategy (based on the reduced level of morbidity, mortality, and hospitalization), may overlook the emergence of drug-resistance as a secondary outcome. However, this potential outcome reduces the effectiveness of antiviral drugs and therefore diminishes its associated cost-savings. In the context of antiviral use, post-exposure prophylaxis may be considered as an effective and cost-effective strategy for reducing morbidity and mitigating illness. However, costsavings achieved in terms of reduced morbidity, absenteeism, loss of productivity, and resource utilization (such as hospitalization) will need to be weighed against costs of strategy implementation (including contact tracing) and wasteful use of drugs for exposed individuals who have not been infected. These considerations in assessing the effectiveness and cost-effectiveness of intervention strategies against influenza infection are beyond the scope of this work, but warrant further study. 1. Moghadas S and Laskowski M. (2014). Review of terms used in modelling influenza infection.  Winnipeg, Manitoba: National Collaborating Centre for Infectious Diseases. 2. Mostaço-Guidolin LC, Pizzi NJ, Demko AB, Moghadas SM. (2011). Chapter 33: A software development framework for agent-based infectious disease modelling, biomedical engineering, trends. In: Mr Anthony Laskovski, editor. Electronics, Communications and Software: InTech, p. 641. 3. Laskowski M and Moghadas SM. (in press 2014). 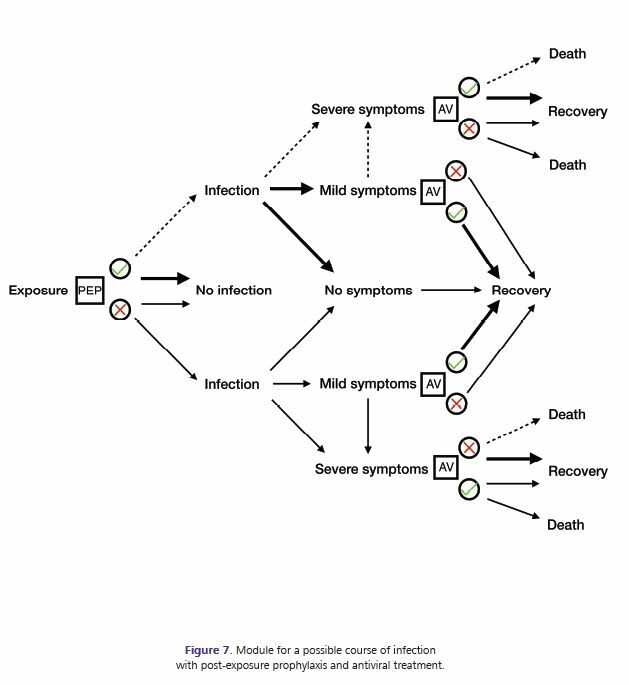 A general framework for agent-based modelling with applications to infectious disease dynamics. BIOMAT Proceedings.